I wanted to do this post before Christmas to coincide with people watching Jingle All The Way as a perennial holiday watch, but I had a lot going on so I didn't quite make it. 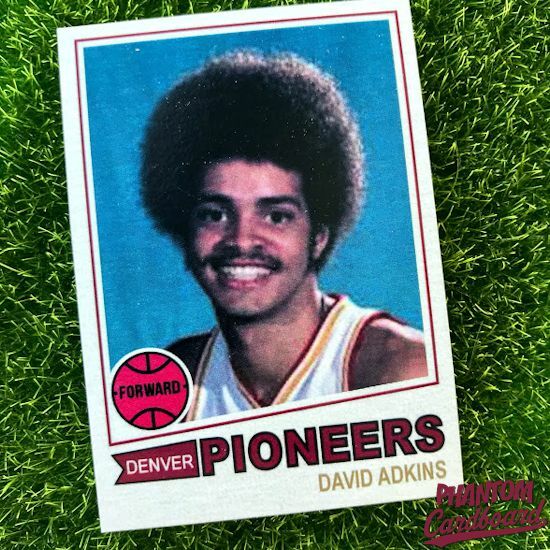 While looking for a photo for the Kevin Nash college basketball card I did I came across this photo above of David Adkins, better known as the comedian Sinbad. Unbeknownst to me the 6'5" Sinbad played college basketball for the University of Denver. I couldn't find too much on his college basketball career. There's not a lot on his time as a Pioneer forward but I was able to find out that he was there from 1975 to 1978, and that average 4.5 points and about as many rebounds in the 50 games he appeared in. I used the same same 1977-78 Topps basketball inspired design seeing as the year fit. Own a copy of this card from the PCb online store.